There is an easier method that works on all platforms for installing from zip files by simply placing them on anetwork file share and adding that file share to the file manager. This page explains how to transfer and install an Add-On from a zip file on XBMC for iOS. 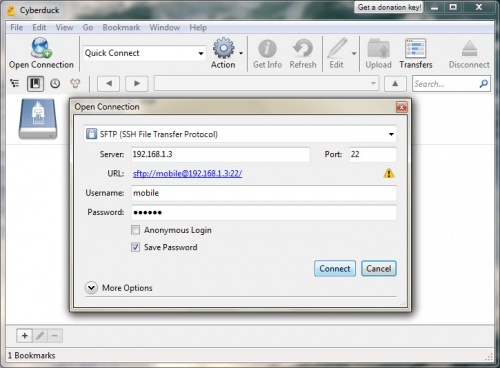 The process makes use of SFTP to transfer the files between your PC or Mac, and an ATV2. Instructions on how to do this using two different open-source programs are given below. Note that Cyberduck is not available on Linux. Cyberduck is free and open source file transfer software. It is available on Windows and Mac OS X. Follow the steps below to use Cyberduck for file transfer. Download and install the Cyberduck client program from the Cyberduck website. Find and make a note of your ATV2’s IP address. You can find this by exiting XBMC, and in the normal ATV2 menu go to Settings -> General -> About. Then look for “IP Address” and use the numbers listed there. It will be something like 192.168.1.3, or something similar that has 4 groups of numbers. Open Cyberduck and click on the “Open Connection” button in the top-left corner of the window. Enter the following information into the relevant boxes, and then click the “Connect” button. Drop down menu: select “SFTP (SSH File Transfer Protocol)” from the list. If a dialogue box pops up stating “unknown host key for [IP address]” then check the box next to “Always”, and then click the “Allow” button. Transfer the add-on zip file into this folder by dragging and dropping from an Explorer/Finder window*. FileZilla is free and open source file transfer software which is available on Windows, Mac OS X, and Linux. 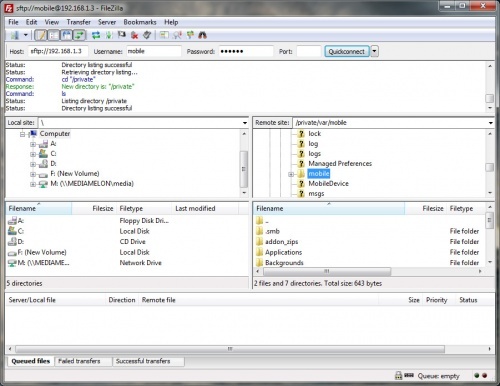 Follow the steps below to use FileZilla for file transfer. Download and install the FileZilla client program from the FileZilla website.